YOU ARE HERE >> Home > What is Psychosis ? Could the way I'm feeling be due to psychosis? Research has shown that there are generally 3 phases to psychosis. However, not all people having a psychotic episode will experience clear symptoms of all three phases. These symptoms are very general and could be signs of many different things, including normal adolescent behaviour. It is always important to be aware of such changes in thoughts, feelings, perceptions and behaviour, especially when they are prolonged over a period of time. The earlier intervention starts, the greater the chance of a successful recovery. This is the stage when the typical psychotic symptoms emerge. It is also the stage that is easiest to recognise and diagnose. Therefore the acute phase is when most people begin receiving treatment. These are the symptoms that are hard to miss. They are intense, active and continuous. They interfere with normal life functioning. 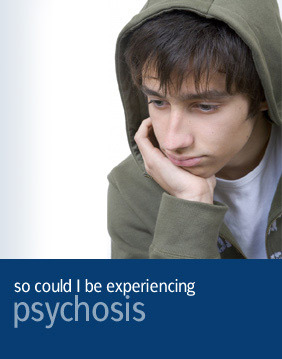 The symptoms of psychosis have often been divided into “positive” and “negative” categories. Positive symptoms are referred to as “positive” because they are viewed as an excess or distortion of the person’s normal functioning. Positive symptoms can be seen as adding something to your behaviour, whereas negative symptoms take something away from your behaviour. Delusions, Hallucinations and Disorganised Speech or Behaviour are all examples of positive symptoms. Some of the symptoms that are apparent in the Acute Phase may linger in recovery. With appropriate treatments, the great majority of people successfully recover from their first episode of psychosis. Possible Symptoms of Phase 3: In the recovery stage, the acute symptoms of Phase2 will lessen and start to fade. However, after the psychosis has responded to treatment, some symptoms may linger. Problems such as depression, anxiety, decreased self esteem, social problems and difficulties with work or school may also occur but these are also treatable symptoms.